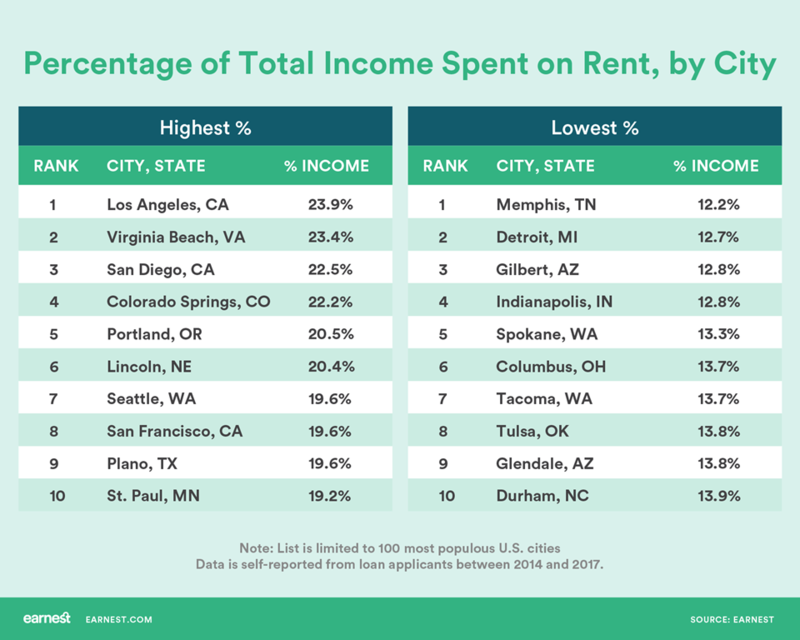 Recently Earnest published a report about rent costs, with the surprising fact (at least for me) that Colorado Springs (where I live) is fourth in the nation for percentage of total income spent on rent. 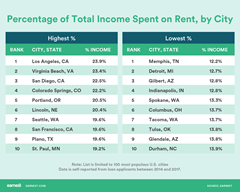 The median rent overall? A smidge under $1400. Do you know what size mortgage you can get for that? Consequently Colorado Springs is going through a bit of a property shortage at the moment, especially in the up-to-$300K range. Sure, there’s quite a bit at higher prices, like $500K or above, but they tend to stick around for several months before selling. But at that lower price? Not much. The reason: people are finding it more beneficial to buy rather than rent, mortgage rates are still very low, and that means housing in that “first-time buyer” range is being snapped up fast. So, when we decided to upgrade to a bigger house earlier this year and plonked the money down, we were fairly certain that our old house would not stay on the market very long. And so it proved to be: we moved out, and, after I’d got it redecorated on the inside, had new carpet put in, and a new dishwasher (don’t ask), it was on the market for a mere 6 days before we got an offer. I signed and closed mid-September. 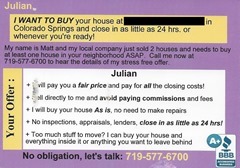 And then a couple of weeks ago I got this postcard, addressed to my new house, about the old one. Remember: I’d sold the latter six weeks prior. Second, it did make me wonder about the deal. What would I have sold it for if I could have just walked away from the house, money jangling in pocket? Well, at the very minimum, I suppose what I eventually got for it, less the realtor costs (6%, urk), less the refurbishments costs (in my case, just over $10K), less the odd extra costs (home warranty? sheesh). Obviously, either way, I’d still have to repay the mortgage principal. I look at the number and I think, nope, there ain’t no one going to give me that amount of cash, on the vague hope they’d save enough on the realtor and refurbishment costs to cover the loans they’d have to get, etc. So, all in all, no I wouldn’t have followed up on this, even if I’d received it mid-July when we actually moved into our new home. It didn’t make sense then, and it certainly doesn’t after I’d sold it. 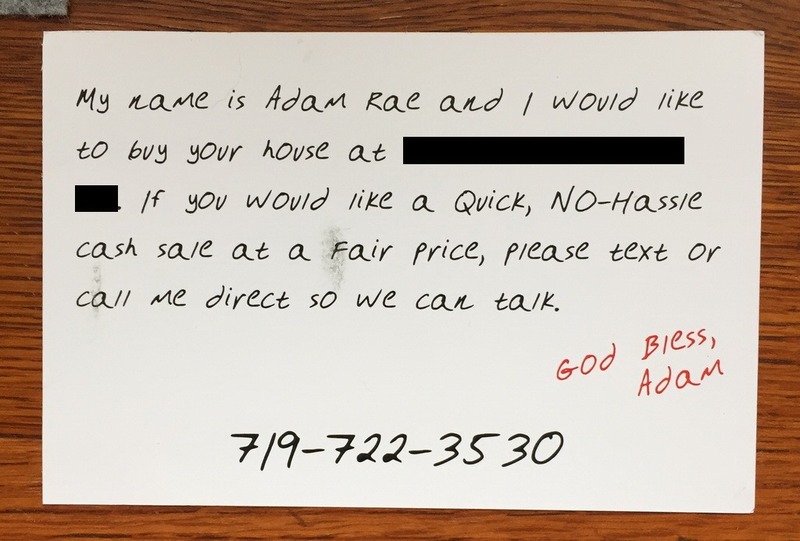 I will note that this is not the only postcard I’d received with this kind of offer. 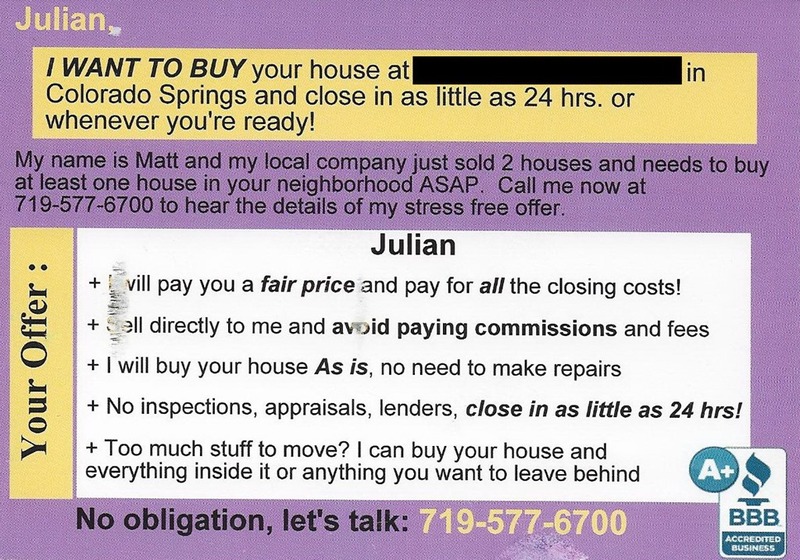 Here’s one I got about a week after closing. And I’ll note that I’ve been getting them on and off from early 2016. 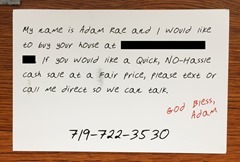 It’s just a weird capital-intensive business: here’s cash for your house, now go away while I do it up and hope to make enough from the sale to pay myself a salary, etc. Unless you’re great at flipping property (I wouldn’t be…), I just can’t see it being a big earner.